See the Invisible Hand. Understand Your World. Writing about economics at Marginal Revolution taught us to use vivid examples and to get to the point quickly. We brought these skills to our textbook, Modern Principles of Economics. nothing was killing them more than bad incentives. 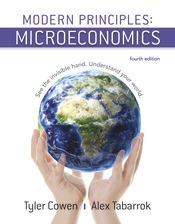 to the last, no other textbook teaches the economic way of thinking so well or so memorably. Modern Principles means modern content and modern delivery. We cover material that many other textbooks ignore, such as how managers should choose between piece rates and tournaments and how firms can increase their profits using clever forms of price discrimination such as bundling and tying. In macroeconomics, we have created a simple yet powerful AD-AS model that combines insights from New Keynesian and Real Business Cycle models. We have also created the Super Simple Solow model which for the first time makes the Solow model of economic growth accessible to principles of economics students. "I can’t tell you how many people I have met who took economics in college, and who hated it. If only they had started with Cowen and Tabarrok. Modern Principles is one of the few books that will immerse students into the elegance and beauty of our science, and which will create a lifelong love of economics."